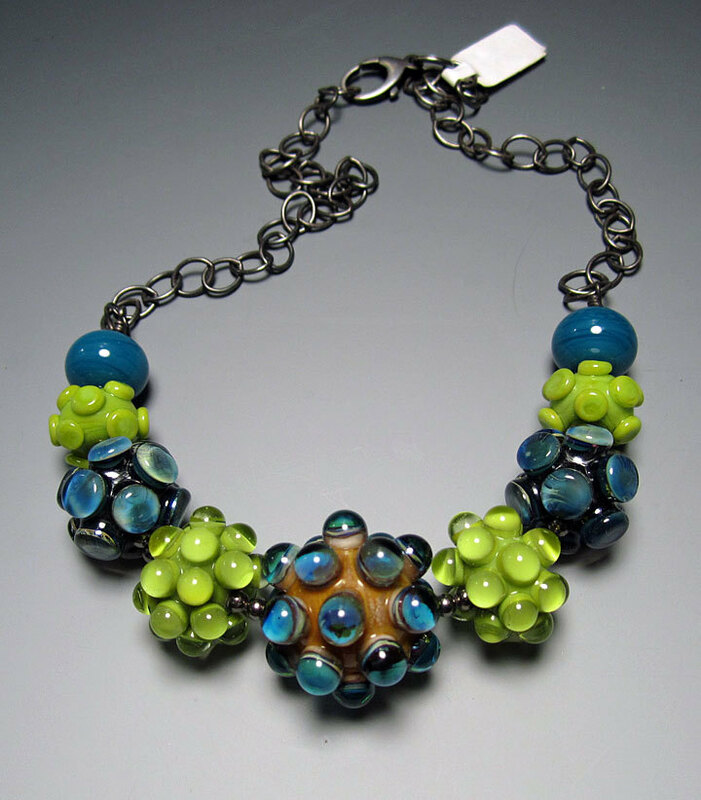 At LORiOLA you will find hand sculpted glass beads and jewelry by Lori Flanders. As pointed out by artist Michelle Banks, some of Lori’s necklaces appear to be made with virus particles, as you can see in the photograph to the left. That necklace is called ‘infectious‘. I make them for a few reasons. 1. They look really cool. 2. They’re challenging to make and since I get bored pretty fast I like to keep pushing & practicing my skill. 3. Some are layers of different colors and I like to see to what the glass does when layered, and 4. They look really cool, right? The fun for me when I work is mostly in sculpting the glass. After I make a ton of beads I lay them all out and see which ones work together in a necklace. 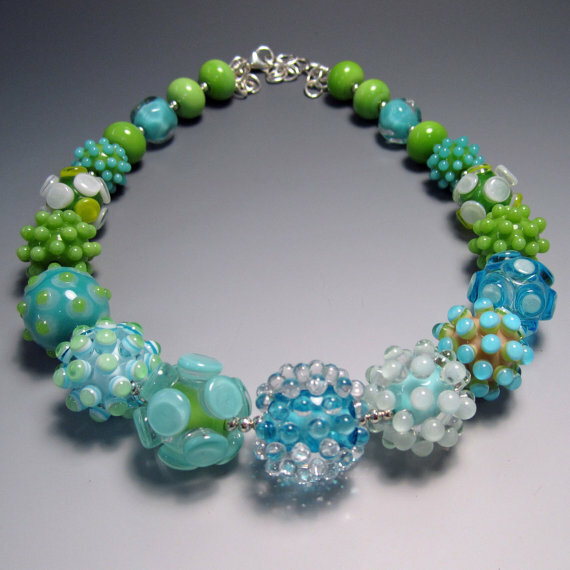 I rarely plan the necklace before I make the beads. One of my challenges when sculpting the beads is to see how perfectly spaced I can get the bumps. 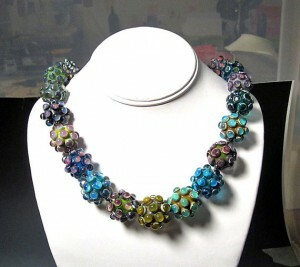 When I designed this piece I had at least 40 beads on my table and just started grabbing the ones that I thought were the most interesting, and would create a balanced graduated necklace. I didn’t really care what the colors were, and honestly if I just listed the actual colors you would probably not believe that they would look this amazing all together. It’s interesting that in making an object that Lori finds beautiful, she ended up with a form that looks like a virus particle. 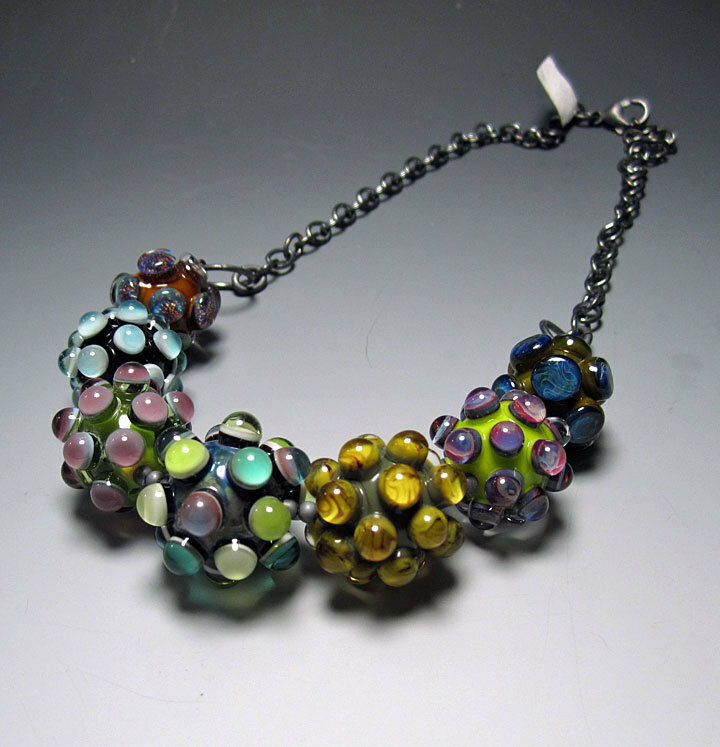 The viruses in Lori’s beads are spherical with projections that could be glycoproteins, or simply capsid subunits. Some of the virus particles represent simple structures, because they contain only five-fold axes of symmetry, while others are a mix of five-fold and six-fold axes that would be found in larger particles. If you don’t know what I’m talking about, you should listen to my lecture on virus structure. 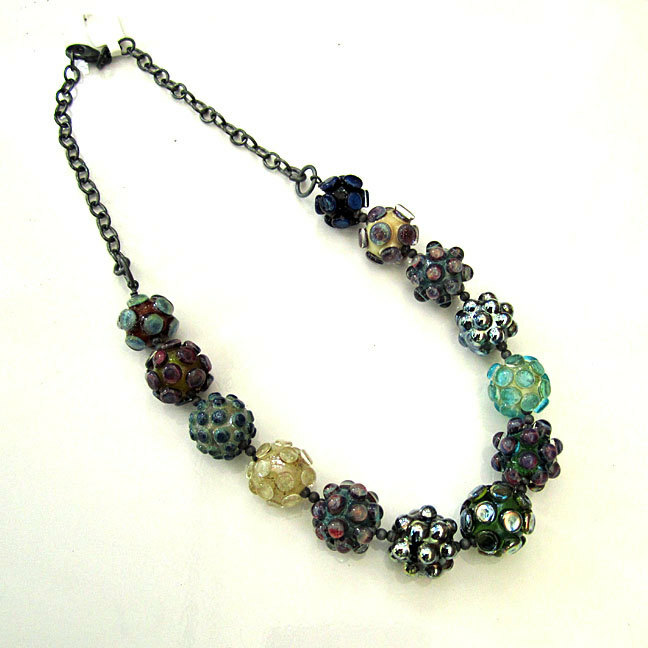 Here are some of Lori’s other cool virus-like necklaces. New and fabulous #3, above, was sold and is no longer at LORiOLA. 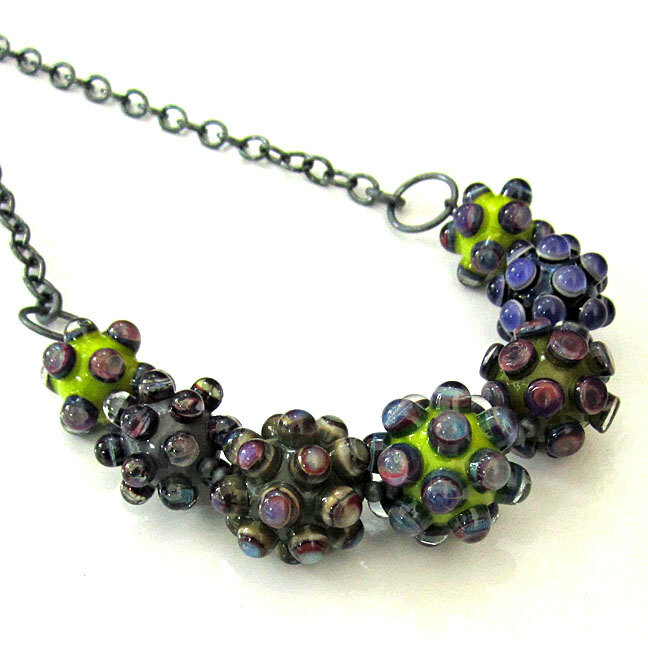 I think that these necklaces are gorgeous – not only because I love viruses, but because they are colorful and wonderfully crafted. LORiOLA is the latest addition to my collection of microbe art.